This virtual implementation of the experi­mental farmlet is based on a hexagonal grid of single-lane access roads. Each hexagon encloses one hectare (10,000 m²) of land. The idea is to accommodate one farmlet per 3 hexagons. 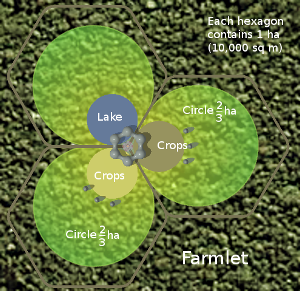 However, the farmlet does not occupy the whole of the three hexagons. Its "private" land is made up of a &frac23; hectare circle within each hexagon. The total area of the farmlet is thus 2 hectares. This leaves a &frac13; hectare of common space within each hexagon. If the farmlet supports two people, each is using only half his share of the Earth's habitable land. 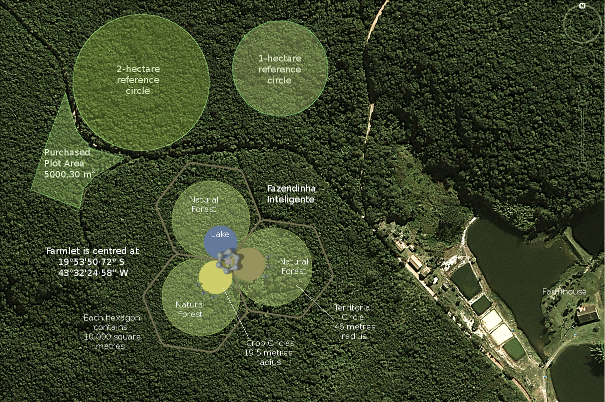 Each &frac23; hectare circle above is transparent to show that it is, by default, part of the surrounding natural forest. The colour of each circle changes from yellow to green radially from the centre of the farmlet. This indicates the progressive diminution of privacy explained in the article Ownership of Land as one moves outwards from the centre of the farmlet towards its periphery. The smaller circles are completely private. Each is 19½ metres radius. The brown and yellow circles are for crops. The blue circle is a lake. 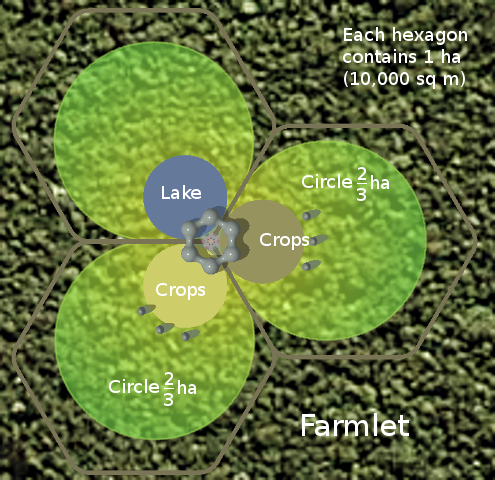 Within each crop circle are 3 ellipsoidal silos for the storage of produce, water and fuel. Each silo also contains internal wind turbines and surface solar-voltaic panels. One or more silos also acco­mmodates a water well, pumping and treatment equipment, communications equi­pment and internal parabolic dish aerials. The silos also house optical spectrum an­alysis equipment for analysing the subtle colours of each crop type to ascertain its progress within its growing cycle and its state of readiness for harvest. At the very centre of the farmlet are the 3 smallest circles. These form the area up on which the dwelling is built. Each has a radius of 11½ metres and therefore an area of 415½ m². Each takes a bite out of its adjacent crop circle, thus making it a crop crescent. A crop circle has a radius of 19½ metres and therefore an area of 1194½ m². The area of a crop crescent is therefore 779 m². The proportion of the large circle under cultivation is therefore 100×779 &div; (&frac23;×10,000) = (just over) 11½%. The proportion of the Earth's habitable land currently under cultivation is 11%. However, one of the three so-called crop crescent areas is the lake. Conse­quently, the two crop crescents add up to only 7·79% of the farmlet. To make up 11%, another 11% - 7·79% = 3·21% (642 m²) of the farmlet can, by rights, be culti­vated, ideally on a rotational basis. The virtual experimental farmlet is shown below set in the Brazilian forest close to the purchased plot. It is centred at 19°53'50·72"S 43°32'24·58"W. The 1 hectare and 2 hectare reference circles are shown to give a sense of scale to the areas that comprise the farmlet. Click on the image to get a larger-scale view under a sep­arate browser-tab. The two crop circles plus the additional wandering 642 m² of cultivated land provide all the food necessary for the farmlet dwellers. The lake is used for fish and for cooling the various systems within the dwelling/workplace. The shells for the dwell­ing/workplace and the silos for this experimental initial instance of the farmlet un­fortunately have to be constructed off-site out of some kind of fibre-strengthened light concrete or carbon-plastic. However, one research project for the farmlet will be to devise a suitable material that can be made from ingredients that can be harvested sustainably from the natural forest. Equipment within the dwelling shells and the six silos render the farmlet completely independent of general utility services. Water is obtained mainly from underground. In the area of the farmlet, the water table is about 20 metres below ground level. One of the silos contains a drilling rig. This sinks and maintains an artesian bore hole directly under the silo. Water is pumped from the bore hole and is then automatically filtered, tested for purity and stored in a large upper tank. Rain water is collected from what falls on the dwelling and silo shells. It is directed into the lake, which has an underground overflow tank for storing excess water dur­ing the rainy season. Rain water is used to sustain crops during the dry season. There are no open streams in the area occupied by the farmlet, but if available a stream could be used both as a water source and as a means of generating electr­icity. Within the drilling silo is also an experimental device for extracting water directly from the air by stimulated condensation. The organic waste, from crop harvesting and food prepara­tion, is recycled via the compost silo. The product extracted from the bottom of the silo is used to fertilize the crop crescents. The farmlet's toilets are flushed with rain water or untreated artesian water. Waste water from showers, wash basins and washing machines is also used for toilet flushing. Sewage from the farmlet's toilets can be processed using active bacteria tanks, reed-beds or banana trees. 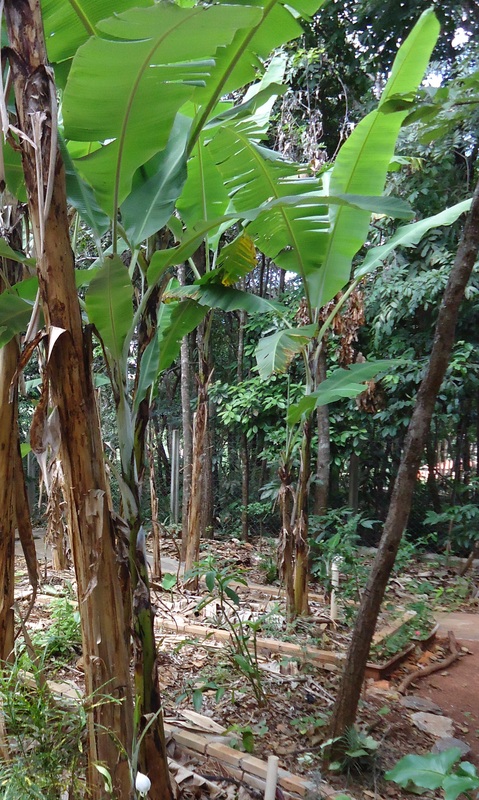 Be­ing in a tropical zone, a banana tree processing bed is most practical. A sample existing banana sewage treatment cell is shown on the right. 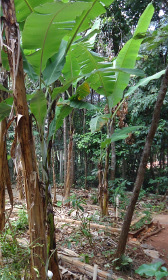 The cell within which the banana tree is planted must be 1 metre deep by 1 m² in area. One such cell is required per person. The farmlet has 5 banana tree cells to allow for two residents plus visitors. The farmlet's sewage cells are circular. Electricity is generated by solar-voltaic cells. These are fixed to the inside of a trans­parent dome that forms the top of the power silo. Output from the cells is managed and regulated by appropriate electronics to charge a large-celled battery in the basement of the power silo. Electricity is also generated by internal wind turbines. These are somewhat less effi­cient than external turbines, but at least they are out of sight. The turbines are of a multi-veined low speed type with multi-coil alternators built around their containing rims. The alternator output is regulated by appropriate electronics to charge the large-celled battery in the basement of the power silo. Additional equipment is used to experiment with the supply of electricity from green diesel, the electrolytic ground effect and small-scale hydroelectric units in places where flowing water is readily available. Electricity is supplied to the farmlet, via an inverter, in multi-voltage format to suit the precise needs of different types of elec­trical appliance. Heat is required for cooking, water heating and for space heating in winter. Al­though this instance of the experimental farmlet is well within the tropics (a little under 20° South), the land up on which it is built is 1,120 metres above sea level. It is also in the Southern Hemisphere, where the Sun is 6 million kilometres further away from the Earth in the winter than in the summer. These effects mean that it can get quite cool in winter. Most houses in the vicinity have internal fireplaces. Not­withstanding, winters are clear and dry so there is generally plenty of solar flux for heating water and internal space. The upper skin of the dwelling shells therefore has a water cavity for capturing solar heat. During the thermally-productive part of the day, coolant is pumped through the skin cavity to thermal storage tanks from where secondary circuits of coolant are routed to provide water and space heating as required. The skin cavities have inset solar-voltaic cells for producing electricity. A collateral effect of the circulating coolant is to keep the solar-voltaic cells from over-heating. The dwelling's internal garden patio includes a wood-fuelled "counsel fire". This is useful for providing warmth in the cool season, but it is mainly for psychological benefit. It could be used for cooking too. Adequate heat for water and space heat­ing is also extracted from a coolant cavity in the skin of the compost (or biomass) silo. The coolant is circulated to the dwelling via insulated underground pipes. A further experiment uses geothermal heat for space and water heating. The arte­sian drill in the drilling silo is used to sink a deep narrow shaft into the ground. A coaxial pipe is then fed down the shaft. Cold coolant is pumped down the centre pipe and hot coolant emerges up the outer pipe. Secondary coolant circuits then circulate the hot coolant to the dwelling to heat the thermal storage tanks. Gas isn't needed but may be used as a reserve cooking fuel. Cooking is normally fuelled by electricity or by sustainably harvested forest wood. More about energy is available in the sustainable energy project section of this web site. Cooling is frequently required in a tropical climate for living space, working space, food storage and equipment. Conventional air conditioners are noisy and are very greedy on energy consumption. For the farmlet, they have therefore been rejected as a sustainable means of cooling. There is a large lake about 350 metres east-south-east of the farmlet. The lake water has a steady year-round temperature of 19°C. The farmlet's small crescent shaped lake is 20 metres higher but not as deep. If it can be fed and drained by a small diversion from a running stream and the surrounding forest trees can shade it sufficiently, it too should be able to maintain a steady year-round temperature of around 19°C. It is therefore able to serve as an ideal heat sink for the farmlet. Space cooling in the summer is therefore effected by circulating coolant around a coil of pipe in the farmlet's lake and (inverse) radiators in the living and working spaces of the dwelling. Radiators of sufficient area circulating coolant at 19°C should be adequate to maintain a comfortable room temperature, even at the hei­ght of the tropical summer. A refrigerator's radiator is clamped in thermal contact with a smaller version of an inverse radiator through which coolant from the lake coil is circulating at 19°C. This vastly reduces the energy consumption of the refrig­erator's compressor. Fan-assisted water evaporation is also under investigation as an experimental means of achieving efficient low-technology refrigeration. While living in the tropics, I often became aware of just how hard my computer's CPU cooling fan was working during hot weather. A small inverse radiator, clamped to the computer case and circulating lake coolant, greatly reduces the strain on the fan and keeps the CPU well within its long-life temperature range, even when doing intensive jobs like rendering ray-trace images during a heat wave. It also reduces the overall electricity consumption of the computer. Communications is also a utility service. Under the present world order, it is unfortu­nately the one utility of which the farmlet cannot, in all practicality, be entirely independent. However, only one form of connection is absolutely essential. And that is the Internet. This is needed for research, communicating with like-minded people and for publishing information about the operation of the farmlet and conclusions drawn from it. The preferable form of Internet connection is by satellite from a dish mounted in the top dome of the communications silo. The preference for a satellite link is to avoid dependence up on Brazilian telecoms companies, who are, in my experience, aggressive and problematic. I have also found them to be critically lacking in the provision of competent technical assistance. In the future, total communication needs between farmlets could be effected via an intranet using long-range links based on IEEE 802.11n with directional aerials. The necessary three hectares of land is acquired. Its limits are physically establish­ed by constructing the bounding hexagonal road system as shown in the satellite image above. The roads comprise two parallel ½ metre wide wheel tracks made of continuous steel-reinforced concrete. The three 46-metre radius land-circles are marked by durable wooden posts every 1 metre around their circumferences. The three 19½ metre radius crop crescents are edged with durable wooden pegs. The three central 11½ metre radius circles are marked by constructing concrete road circles around their circumferences. These road circles are of the same construc­tion as the hexagonal road system, and indeed form part of it. Two small deep cyl­indrical concrete plinths are installed on each of the three central islands as ground mountings for the accommodation shells. In the case of this first experimental farmlet, the accommodation shells and the silos must be constructed and equipped off-site. They are transported - possibly airlifted - to the site. The shells are mounted on the 6 concrete mountings and the silos are set in their appropriate locations within the crop crescents. The shell moun­tings have built-in ducts for service piping and cabling to connect the shells with services from the silos. The shells and silos arrive ready-equipped with all necessary systems and services. All systems and services are equipped with built-in monitoring and control interfaces. All systems and services are connected, tested and commis­sioned. The crop crescents are prepared for planting. The initial crop-mix is formulated from a prescribed diet plan, which itself is designed to meet optimal human nutri­tional requirements from species that thrive in the prevailing soil and climate of the farmlet's geographical locale. Growth progress is monitored and the harvest quality and yield is documented. Monitoring is done directly by computer-controlled active devices. After the harvest, the growth cycle and yield of each species of crop are analysed. The analysis is used to improve methods and procedures for the next cycle. The monitoring and analysis is performed iteratively to continually improve yield, quality and adaptation to the locale. This same iterative cycle of performance monitoring, analysis and improvement is applied to all the farmlet's systems and services. At first, this could merely indicate possible improvements to control and monitoring algorithms in the software. With time, however, it may demand design improvements that could necessitate funda­mental re-thinks regarding the forms and functions of some or all of the farmlet's systems and services. All crop-mix and yield data is published on the Internet. So too are the methods and procedures, together with any changes and the reasons for making them. The performance data for all systems and services is also published, together with any changes made to monitoring and control algorithms, plus the details of and reasons for any re-designing. All this structural, functional and operational information is ab­stracted and presented in a form that is independent of the particulars of this im­plementation of the experimental farmlet. Consequently, it is seamlessly applicable to farmlets in general. The combined dwelling and workplace of this experimental farmlet is extremely un­conventional in its design. It is designed this way, not only to serve as an inspiring place to live and work, but also as a flagship site for the Landshare Project. The intent is that it should be a pleasure for interested parties and groups to visit and see how its plethora of alternative technologies operate. Notwithstanding, not everybody who is interested in creating and inhabiting their own eco-friendly farmlet wants such a radical design. Most will, at least initially, pre­fer something simpler and cheaper but which embodies the same technological principles and advantages. The functionality and methods abstracted from the implementation and use of this experimental farmlet are therefore used to design simple highly adaptable systems accommodated in simple modular shells that are cheap and quick to construct and mass-produce. An accommodation shell can be cubical, cylindrical, ellipsoidal (as is the case in this particular implementation of the experimental farmlet) or even conical like a tepee. It can be made of local natural materials like wood and resinated fibres. However, modern materials like light-concrete, metal, fibreglass and carbon-plastic are not ruled out, provided they are durable in the long-term, thereby justifying ecologically the energy used to extract and form them. Shells are designed to be inter-connect­ible in a wide variety of configurations to meet the needs of a wide variety of people in a wide variety of circumstances. Full details of these cheaper and simpler implementations of the systems and serv­ices developed through this experimental farmlet are also published. These details include clear simple descriptions, explanations and instructions for anybody who wishes to construct and live in their own self-sustaining utility-independent farmlet. This information equips people - even in poor areas - to construct simplified accom­modation shells, and install their systems and services, as do-it-yourself or local collective self-help projects from basic standardised components. It is hoped that hereby people will become inspired to build and live in their own comfortable eco-friendly self-sustaining utility-independent dwellings. This Landshare Project thus provides the information that people need in order to be able to build self-sufficient homes with modern services that do not depend on being within reach of conventional water, electricity, gas and communication net­works. It thus empowers people to be able to choose to live and work, in a modern way, anywhere within the 130,693,000 km² of habitable land on this planet. Opening up this vast new area to high quality human habitation should reduce and eventually reverse the relentless flow of poor people from the countryside as they gravitate into large cities, continuously swelling the metropolitan under-class. This, however, would necessitate a quantum shift in the prevailing political paradigm and a radical redefinition of what is meant by ownership with regard to land. Sadly, due to the land scam of which my friend was a victim, I decided not to atte­mpt to buy the necessary adjacent land for the Landshare Project from this dubious vendor. As a result, I became discouraged with the legal complications of buying land in Brazil. Consequently, I have no land on which to construct and implement this particular experimental farmlet. The Landshare Project in Brazil has therefore been abandoned.